Workshops on varied topics are periodically held to supplement class room teaching and for the personality development of all students. Experts are called every year and workshops are held on new topics from various fields. “Laughter”, “Manners & Etiquette”, “How to prepare for Exams”, “Clay modeling”, etc. are among the few workshops which have been held in the past. S.R.M.P.S., under the able guidance of our Principal Major Rajesh Ranjit, organized a two-day science workshop for teachers on 11-12 August 2018. Eminent professors in the fields of Physics, Chemistry and Biology – Dr. B.N. Das [Retd. Prof. in Physics, Vivekananda College, Kolkata], Dr. Arindam Rana [Asst. Prof. in Chemistry, City College, Kolkata] and Dr. Mrinal Mukherjee [Asst. Prof and H.O.D., Department of Education, Bankura University] were invited. The workshop was one-of-its-kind where we could witness experiments and teaching methodologies which can be easily done in the classroom environment with very easily available, day-to-day materials. We also came to know how all subjects like Chemistry, Physics and Biology along with Mathematics and Social Science are integrated. Therefore, coming to the conclusion, that subjects have no boundaries. In BIOLOGY, we were told that pulses (which are considered to be rich in protein only) also have carbohydrates. So it gave a positive test for both Starch and Protein. Similarly, we witnessed osmosis in vegetable and fruits. Dr. Mrinal used a simple chalk to show chromatography. We were also taught the possibility of being able to calculate the number of stomata in a leaf (Catharanthus roseus or formerly Vinca rosea) with the help of a graph paper. In PHYSICS, Dr. B.N. Das performed different activities based on liquid pressure, cohesive and adhesive forces, atmospheric pressure, surface tension, amazing experiments on magnets, demonstration of properties of diamagnetic and paramagnetic materials. Adiabatic process was demonstrated by squeezing simple plastic bottles. In CHEMISTRY, Dr. Arindam Rana focused on activity based teaching and to relate topics with real life examples and experiences. He also said that the children should be motivated to ask questions and the teachers should go beyond their syllabus. He discussed simple methods to learn symbols, valencies and also tricks to balance given chemical equations. At the end, an interactive session with the students and the teachers was organized to cater to the problems faced by them in the classrooms. It was a very fruitful session and the participants enjoyed it a lot. We learned the importance of learning by doing. SRMPians welcomed Harshita Sharma, Jolly Phonic Trainer, at a Phonic workshop at Shri Ramswaroop Memorial Public School, Lucknow on January 10, 2017. This workshop was basically for the faculty members of SRMPS. Ms. Sharma shared her experiences on Phonics with all. She shared some methods through which learning of letters and its sounds can be very convenient to the students. She focused on some very elementary topics related to different letters, its sounds and syllables. 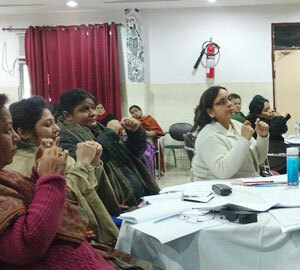 The teachers participated enthusiastically in all the activities during this workshop. Vote of thanks was given by The Principal Mr. S.N. Singh. The workshop ended in a fruitful and beneficial way.